Specialist UK Restorations Ltd (SUKR) are experts in the repair, restoration and preservation of timber in building refurbishment projects for many different reasons. These include; deterioration due to water ingress and damp penetration, leading to fungal attack with wet or dry rot and attack by wood boring insects or fire damage. 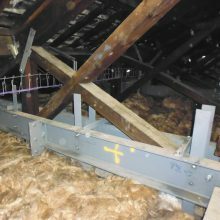 increased fire resistance and increased durability are all typical of the requests to SUKR for assistance with timber repair and restoration. SUKR can expertly repair damaged timbers using both traditional and innovative modern techniques. These can be used to maintain integrity where rot or damage is severe, eliminate boring insects and apply appropriate preservatives to prevent their return. SUKR can also carry out all of the associated building refurbishment and engineering work with our own ‘in-house’ teams to provide a full and holistic approach to projects. Decaying and/or deteriorating timber structures? Dry rot fungal attack (Serpula Lacrymans)? Wet rot attack from moisture (Coniophora puteana)? Fire damage to timber framing? Suffering from woodboring insect attack or infestation? Want to restore painted timber areas to original glory?